It seems that everywhere you look there is the next best product to make your smile white. You can’t walk down the oral hygiene isle at the grocery store without seeing White Strips, whitening toothpastes, mouth rinses, and pens. Pinterest is full of DIY methods to whiten your teeth. There are whitening kiosks at many shopping malls. Then, you go to your dentist and they offer even more ways to brighten your smile. How do you know what product will work the best for your smile and give you the most cost effective results? We are here to shed some light on your options and help you find the perfect product for your needs. It doesn’t matter if it is Crest, Colgate, Sensodyne, or Toms of Maine, every brand of toothpaste seems to have its own whitening edition. These range from your average tube of toothpaste to a multi-tube system like the Crest HD system. Whitening toothpastes can range in price from $1-$11 depending on the size and strength. Among the whitening options, toothpastes are low on the effectiveness scale. They work in a similar fashion to sandpaper. The better the “whitening” the more abrasive the toothpaste. These pastes have a higher count of rougher, grittier particles than regular toothpastes because they aim to remove some surface stain. Unfortunately, they can also remove some enamel, cause sensitivity, irritate the gum tissue (hello bleeding), and even cause gum recession. At Generations Dental we don’t typically recommend these toothpastes because the marginal whiteness that can be achieved with these products can also be achieved with regular dental cleanings and better results can be achieved with other products. The adverse effects just don’t outweigh the results. There isn’t a whitening mouth rinse on the market that actually has proven results. Skip the whitening mouth rinse for either a fluoride/anti-cavity one like ACT or a gum healing rinse like Listerine or Crest ProHealth. Studies have shown that the products that try to do too much, end up being less effective in all areas. If you are going to take the time to swish, make it worth your while. This category includes the Crest, Rembrant, etc. White Strips. These are flexible plastic strips that are coated on one side with a mild bleach. You peel away a backing and press the strip to your teeth. The goal is to achieve the most contact possible between the strip and the teeth, because the bleach can only whiten what it touches. These strips tend to run anywhere from $20-60. They are effective for most mouths but may take multiple boxes (purchases) to achieve desired results. This is due to a weaker concentration compared to prescription products and the fact that leakage of saliva around these slippery strips weakens the bleach. They may not work as well for those with more irregularities in their smile, because it is difficult to get these flimsy strips to touch every nook and cranny. Overall they can be worth their dollars and are a great entry product into the world of whitening but there may be more effective options for some smiles. Whitening Kiosks are a growing trend in malls nationwide. And why not? What sounds better than 20 minutes for a whiter smile? These providers normally shine a special light on your teeth for a period of time, possibly after applying a special whitening product to the teeth all while you sit relaxed in a comfortable chair. The cost can range anywhere from $40-100. 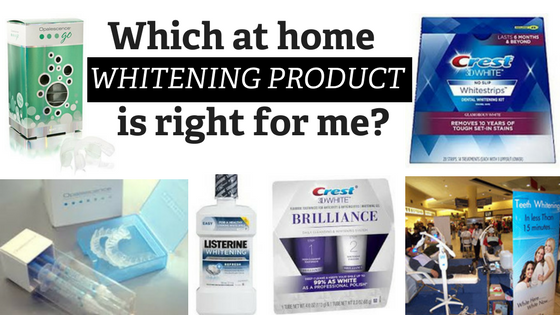 Most times people walk away with whiter teeth, but does this whiteness last? The way the light systems work is that they actually dehydrate the teeth. When teeth get dry, they appear whiter. As they become re-hydrated the whitening effect is diminished and may completely reverse. Since these providers are not licensed doctors, they cannot apply any whitening product that is prescription strength that may be “activated by the light.” There is no real certification process for these “Whitening Professionals” and so the safety of these procedures should always be evaluated with caution. Excessive heat from a light can damage the nerve of a tooth, either temporarily or permanently. This can cause extra sensitivity to temperature but also could lead to a root canal down the road. Since the safety and efficacy of these kiosks are unregulated, we do not recommend this method as mode for tooth whitening. Professional whitening is offered at a prescription strength. These types of products require a licensed dentist to examine the patient to ensure that the product is safe and recommended for the type of whitening desired. Professional products for home use come it two forms: pre-formed prescription strength trays and custom trays. Pre-formed trays, like the Opalescence Go trays offered in our office, are sturdy but slightly flexible trays filled with a thick prescription strength whitening gel. The trays are pressed to the teeth to help the gel reach and touch all the curves of the tooth surfaces. Unlike white strips, this thicker gel in not slippery or easily washed away by saliva. It is also a stronger formulation and most patients find one $70 box will achieve the whiteness desired (rather than 3 boxes of $45 white strips). They are very safe with limited tooth sensitivity or gum irritation under the guidance of a dental professional. The final home whitening product is the custom fabricated bleaching tray. These trays are made from a mold of your mouth and perfectly adapt of every curve of your teeth and smile. They can be reused for years and years as long as tooth shape and position remain relatively constant. Tubes of bleach can be purchased at different concentrations depending on patient needs and desires. Custom trays tend to run about $150 per arch (top or bottom) or $300 for a full mouth set and include the first set of bleach. Replacement tubes go for $35-50 but will last for years. This option is best for those with inconsistency in tooth position that may struggle to get a pre-formed strip or tray to touch each surface. It is also recommended for patients with more stubborn discoloration such as stains caused by medications or heavy tobacco use. They are an investment but do yield the best results. As a dental provider, we are always happy to discuss all possible methods to whiten your smile and recommend a product that would achieve the results that you desire. We will cover the efficacy and safety of DIY whitening and some in office whitening procedures in a future blog. Please feel free to ask or call about any whitening questions you may have. We believe everyone deserves their best smile and we are here to help you get there.